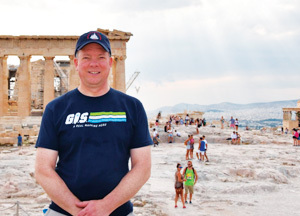 Sean Fitzpatrick, the director of enterprise asset management for the Metropolitan Transportation Authority (MTA) in New York City, used his Esri T-shirt to show other visitors at the Acropolis in Athens, Greece, what a real mapping hero looks like. 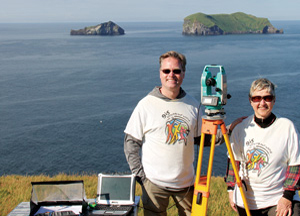 Brian Hall, a GIS analyst with the Washington Department of Fish & Wildlife, and Kathryn Scott, the GIS coordinator for Washington State Parks, recently spent two weeks on Vestmannaeyjar Island in Iceland, where, as volunteers with Earthwatch, they helped collect data and assisted scientists from the Icelandic Orca Project. 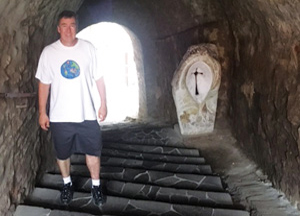 Brian Mladenich, the GIS operations manager for the Cow Creek Band of Umpqua Tribe of Indians in Oregon, wore his Esri best to Nevytsky Castle in Zakarpattia Oblast, Ukraine, while on a trip to visit a friend.